If you have been reading my blog for a while now, you will know that I am a serious fan of fiber. Of all the important components of food, fiber is right up there with the best of them. I mean, who doesn’t want to go to the bathroom regularly, stabilize their blood sugars, reduce their cholesterol, and stay feeling full for longer so they don’t overeat? Yes please! Sadly most Americans don’t eat nearly enough fiber. Perhaps it’s because, when we think of fiber, we think of gnawing on fibrous old vegetables. 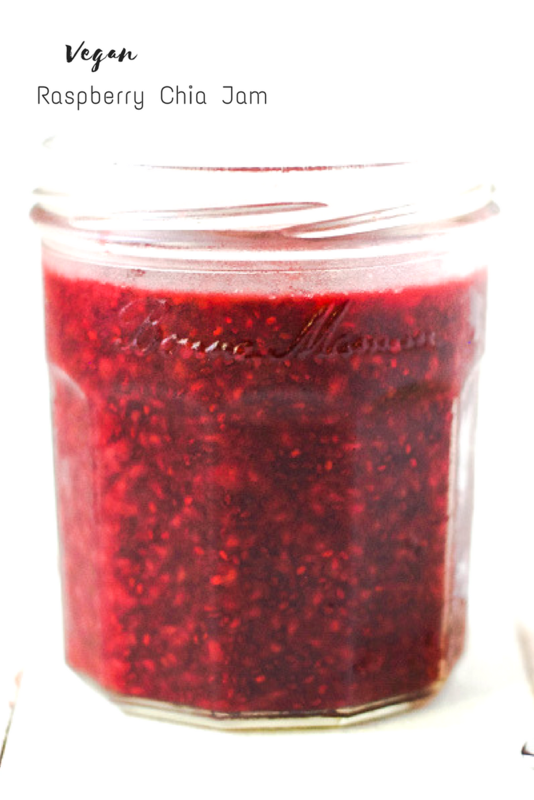 But what if you could increase your fiber intake by eating this delicious vegan raspberry chia jam? Chia seeds pack some serious nutritional punch. Just 1 ounce contains around 12 grams of fiber (that’s almost half your daily requirement). They are an excellent source of omega-3 fatty acids, which have been shown to help lower triglyceride and cholesterol levels, lower blood pressure, act as an anti-inflammatory, and protect against arthritis, cancer, and autoimmune diseases. Chia seeds also have significant antioxidant properties. They contain flavonols and phenolic acids, including Quercetin, known for its antioxidant, anti-inflammatory, anticancer, and antithrombotic properties. 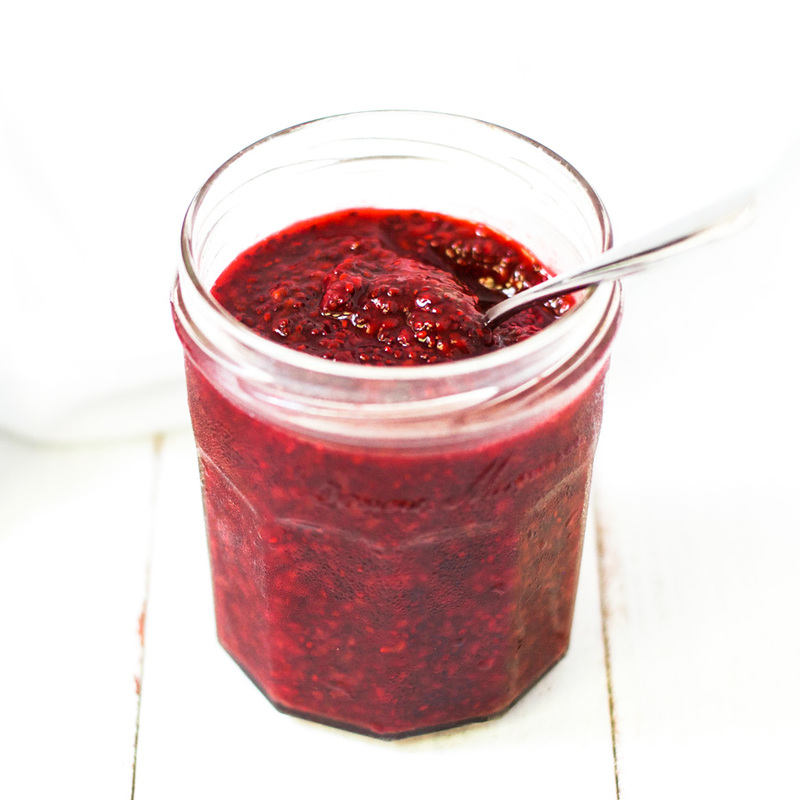 And when you combine them with raspberries, freshly squeezed orange juice, and a little maple syrup, they turn into this delicious vegan raspberry chia jam. 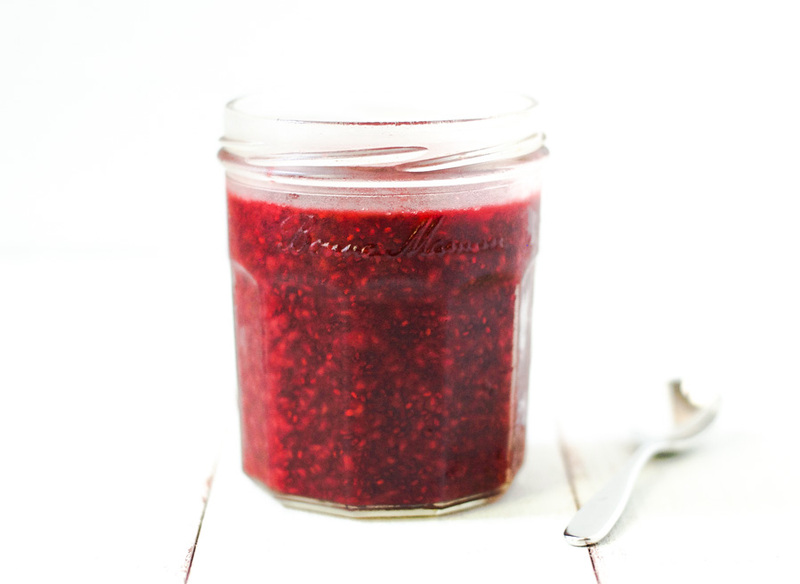 If you want to learn more about vegan jelly and jam, check out this great post from thrivecuisine.com. 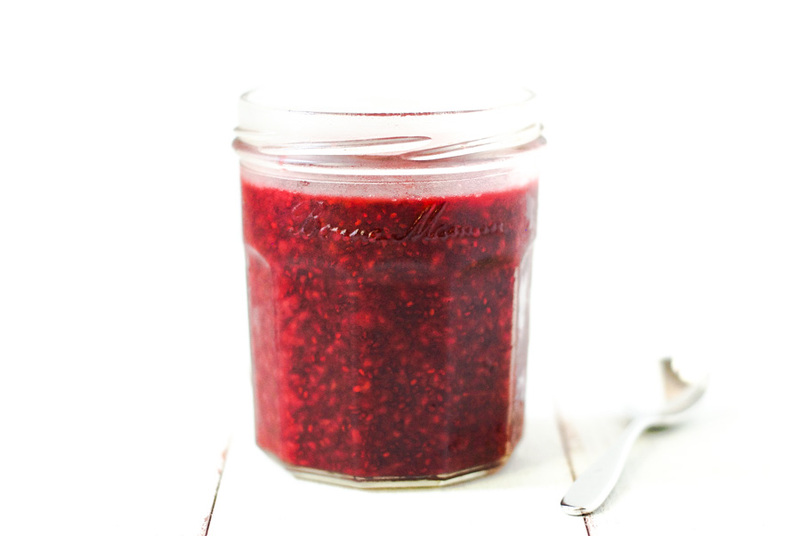 This vegan raspberry chia jam is high in fiber, low in sugar, and only takes 10 minutes to make. Put the raspberries in a small pan over a medium low heat and cook until the fruit softens (about 5 minutes). Mash the raspberries with the back of a fork. Add the chia seeds, maple syrup, and orange juice, stir well and leave to cool. Store in an airtight jar in the fridge for up to 2 weeks. You can also freeze it for up to 3 months. Hi, at this time a year it’s hard for me to get fresh berries, is it ok to use frozen ones? Absolutely! That’s one of the great things about this recipe.